I have one question: why is he a red shirt? You know what happens to red shirts, don’t you? I’d say our former-captain is about to go through the wringer, experiencing violent, but humorous accidents that would kill an ordinary red shirt, similar to Wile E. Coyote. Lots of potential for visual “death-gags” here. Is this comic over or will it eventually return? This comic’s funny and charming. I’m a bit sad it’s effectively on indefinite hiatus. Please! I need this to justify my pathetically limited existence! So, I’m guessing it’s pointless to hope for another installment? I hope very much this will update again – if not, thank you for what you were able to post. It’s made me smile every time I come back and read it. I think the comic is dead, Jim. 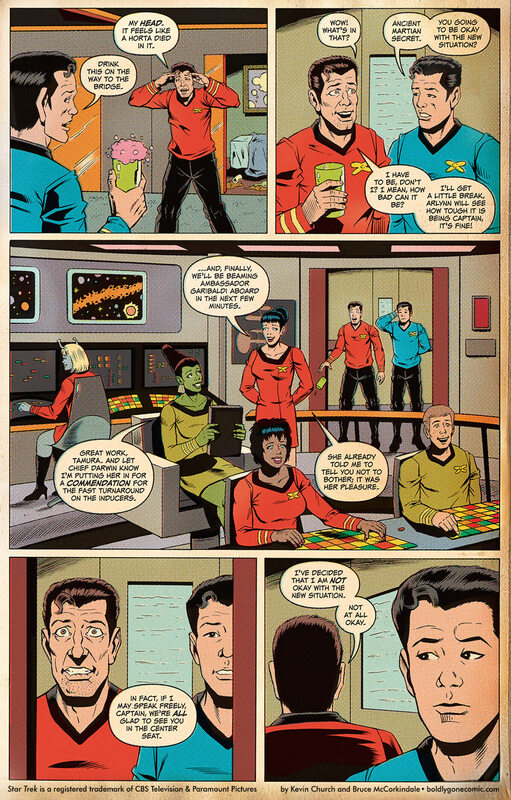 Its a shame that a good take on trek like this is basically dead before it even got started, and trash like ‘star trek the webcomic’ is still going on.